Hey cat people, do you think your furry friend has been unfairly shut out of happy hour? Omega Paw feels your pain, which is the most likely explanation for their Meowtinis, Meowmosas, Meowgaritas and the rest of their line of cocktail-flavored cat treats. Before anyone gets upset that someone is encouraging you to get a nine-pound feline drunk, the treats are merely cocktail-inspired. You won’t need to call the cat an Uber at the end of the night. 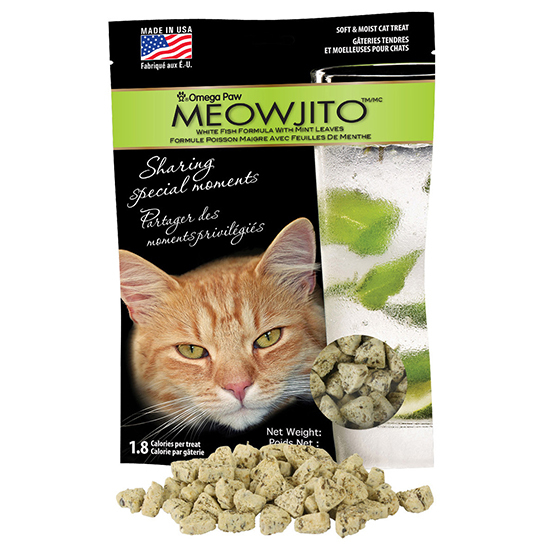 The Meowjito, for example (the list of meow/drink puns is a long one), is made of white fish flecked with mint. If your cat is wasted, it’s because you let her get into that giant glass of red wine you walked away from while you thought she was feasting on some Meow Merlot. So that’s on you. If you prefer to share your evening drinking experiences with cats instead of people, you can get more information about the treats here. Oh, and for you canine people, Omega Paw makes beer treats for dogs. To that we say: Get with the times, Omega Paw, kitties can like IPAs, too.